[/caption] I finally had the opportunity to visit Seattle and take some photos of the city. Just before my trip I read that Travel+Leisure 2009 had rated the top 100 cities in the world with the most scenic skylines. Seattle was rated #10 in their magazine. I was surprised to see them get such a high ranking. After all, their #10 ranking was for the world, not just for the United States. I figured that I really needed to take some good shots in order to really show the beauty of the Seattle skyline. I did my homework and found several areas throughout the city that were known for the best city views. I went to every scenic viewpoint that I could find and made sure to return for the best sunset shots. I drove to almost every neighborhood in the city so I could really take in the personality within the city limits. West Seattle is where I took this photo on the blog page. I first arrived to this spot in the afternoon and I knew that this would be the best place for sunset and twilight shots. 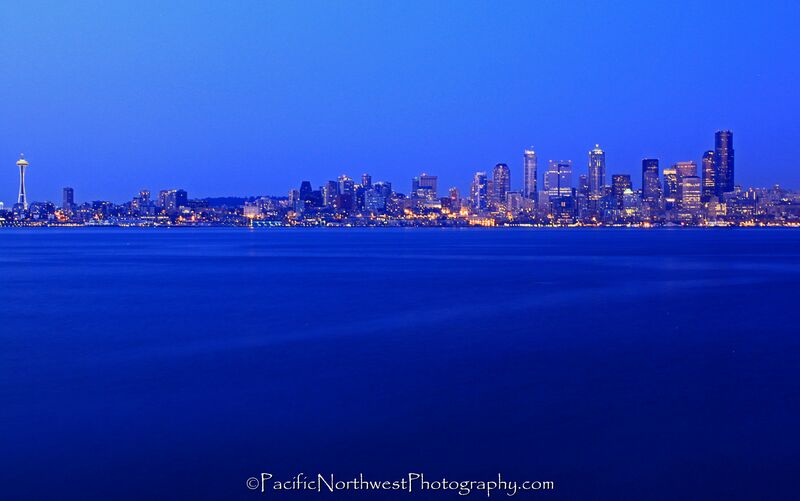 West Seattle is the best place to get an entire panoramic photo that really shows just how massive and beautiful the skyline is. You can also watch all of the boats enter Elliot Bay. I was fortunate to find great vantage points from the north, east, south and west sides of the city. It would take several weeks to really capture all of the photography areas within Seattle. To get this shot, I removed my CIR-PL and my warming filter since the sun had already set and the color of the scene was calm. I set my camera to Program mode. The F stop was at 10 and I had the ISO setting at 200. The White Balance was at 0 since the color was almost perfect. I was using the shutter priority and I had it set at 20 seconds in order to maximize the glow of the lights. Since the bay is so busy it can be hard to use a long exposure without have a moving boat in the photo. This is especially true if you don’t want to show the movement of the boats in the foreground of your shot. I plan on returning again as soon as possible so I can continue to get some great photos of the city. [/caption] Newberry Crater is one of the best places to visit in Oregon if you want to get the most of everything in one park. Paulina Creek spills from one of the the Caldera lakes and eventually spills over an impressive waterfall. There are two huge Caldera lakes that were formed when the volcano erupted and then several other eruption’s also created the Big Obsidian Flow and other historical features throughout the park. There is also a lakeshore hot springs, the gigantic flow of obsidian glass and a miniature cinder cone crater. There are several hiking and mt. biking trails throughout the park as well as the steep trail that takes you to the summit of 7,984 Paulina Peak. Paulina Peak is the dominant peak that’s left of the Caldera when it exploded. Most of the crater’s edges around the volcano were mostly leveled by the force of the explosion. There are two Caldera Lakes which are Paulina Lake and East Lake. Each lake is teaming with trout and salmon. As you drive towards the summit area you are within a 17 square mile caldera at the summit of a 500 square mile volcano, a volcano that remains very active to this day. Newberry is both seismically and geothermally active. Geologists believe the caldera sits over a shallow magma body only 2 to 5 kilometers deep. Newberry Crater is considered an active volcano that is expected to erupt again. It’s made up of ash, pumice, lava, cinders and mudflows and contains about 100 cubic miles of volcanic material. There are several campsites and several small cabins that you can rent. The great thing about this place is that you will eventually learn a lot about geology without even realizing it. 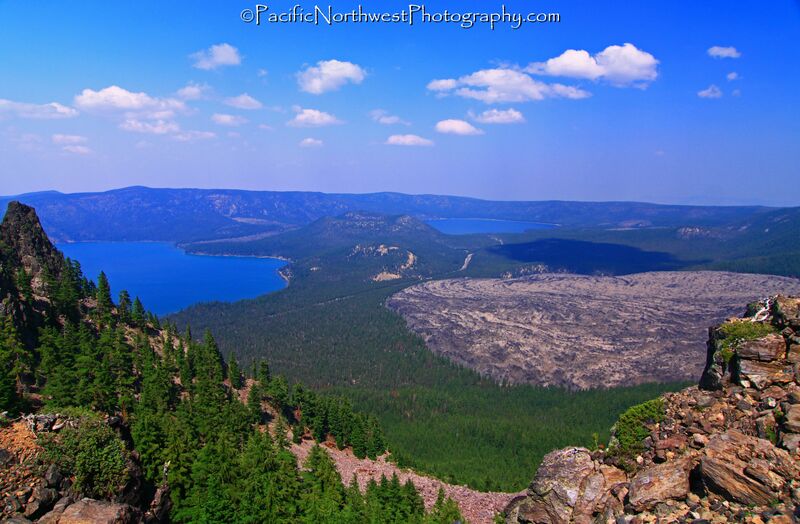 This shot was taken from the summit of Newberry Crater. There are several short hiking trails at the summit and there is a fairly short but very rough gravel road that takes you to the summit. On a clear day you can see several cinder cones dotting the Central Oregon landscape as well as several of the Cascade Mountains. However, there was a large forest fire that caused the forest below to be covered in haze as well as the sky. I decided to use this photo since it shows both lakes and the Big Obsidian Flow below. You can also see the giant cinder cone separating the two lakes. To get this shot I used my 12-24mm wide-angle lens and had the focal length at 13mm. I wasn’t using my tripod since there was limited shadows and full light. I had the camera in Program mode and I was using my CIR-PL, warming filter and my UV filter to cut down on the brightness of the sky and field of view. The F stop was at 7 and the ISO was at 100. I set the white balance to 0 since I was facing directly away from the sun but there was a strong haze that created too much darkness when I trial to reduce the white balance. The exposure time was 1/100 of a second. Having some clouds helped give it some personality but the hazy sky really made this shot difficult and there really isn’t much you can do when there is a forest fire nearby and lots of haze to contend with. [/caption] One of my favorite places to hike within the Mt. Hood National Forest is where this photo was taken. There are only gravel roads that take you to this part of the mountain, which eliminates most of the crowds and reduces any road noise far below the trails. Another great reason is due to the fact that there are no signs of any clear cutting of the forest and there are over 7 trails zigzagging throughout the National Forest. The PCT cuts right through the trail systems and there are several other trails that take you in any direction. As you can see, this is also one of the best areas to get the best view of Mt. Hood. Mt. Hoods personality really shines from many of the vantage points. 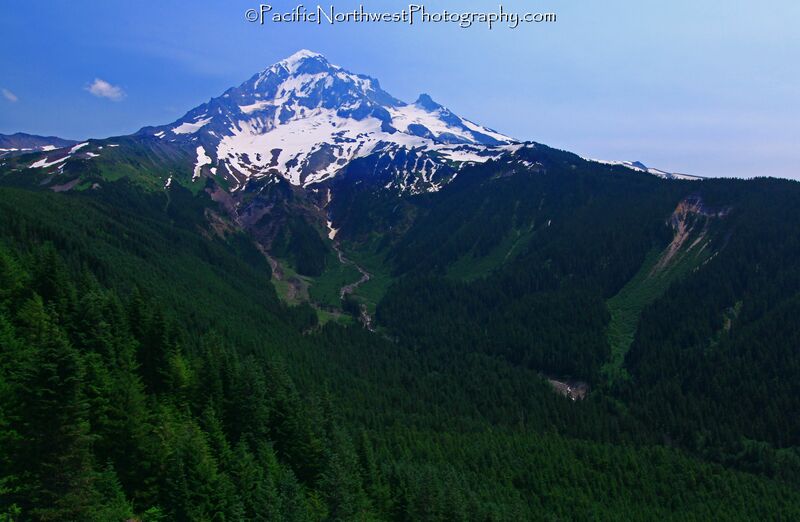 You can see its glaciers, the carving of the huge canyon below and also the birth of the Sandy River. Wildflowers grow along the creeks, the trails edges and along the many cairns exposed to the elements. This is truly a magical place that can really calm the senses and create an epic adventure. There are also many photo opportunities as well. if you decide to hike down to the muddy creek area, you can witness several towering waterfalls and almost hear the echoing of the alpine glaciers. However, the bridge across muddy creek which connect to Romona Falls is still out and has been for a several years. Unfortunately this means that you have to turn back once you get to the creek. However, you can hike back up and then hike along a different section of the timberline trail towards McNeil Point. This part of the trail opens up to some spectacular views. I took this shot posted on my blog at Bald Mountain. This is a very popular spot to photograph Mt. Hood and for good reason. It allows you a great panoramic view of the mountain, the forest and the forest below that was carved out by the elements. For most of the day I was using my tripod but when I took this shot I wasn’t using it. The morning started out a little hazy and the sun was fairly bright. I had the camera set on Program mode and I was using my CIR-PL, warming filter and UV protector. This helped cut down on the harsh light created by the sun and haze. The exposure time was 1/125 second, the F stop was at F8 and the ISO was at 100. I set the white balance at -2 since there were no shadows and I was in an open area with too much exposure. I was using my 12-24mm wide-angle lens and the focal length was at 20mm. I’ve made this hike three times now and it’s one of my favorite places to hike. [/caption] I finally decided that it was about time that I went on my first winery tour and I figured that there was no better place to start than near my own backyard. My wife and I decided that we would tour as many wineries within Washington County as we could. After visiting the visitor center, we mapped out our touring route and headed out towards Forest Grove. We figured that we could visit up to 8 vineyards without being too rushed. However, we were only able to visit 5 wineries on this trip. Our first winery was Elk Cove Vineyards, which had spectacular views of their winery and also of the many trees along their property. We then headed out to Patton Valley Vineyard, which consisted of a twisty gravel road. The hospitality was wonderful and I was given the opportunity to take some photos inside the chilling room. We then found ourselves at Plum Hill Vineyards, which also was just off a gravel road, near the main highway. The tasting room was colorful and relaxing. The owner was gracious enough to give us a grand tour of their winery operation. We got a glimpse of the winery operation and saw just how difficult and time consuming it can be. The hospitality was again fantastic. We then headed out to Montinore Estate. The building may have been constructed of concrete but once you got near the entrance it took on a feel of an old west building. The interior was very welcoming and really made you feel like you were in a grand tasting room. Again, I was given permission to walk along the vineyard and take photos of the grounds and the vineyard. Our final destination was David Hill Vineyard & Winery. The tasting room house was an old English style home that was right in the middle of the vineyard. The grounds were well manicured and there were several rolling hills of vineyards throughout their property. All of the wineries mentioned were surrounded by their vineyard, which makes for a great atmosphere as well as many photo opportunities. Since I’m trying to become a wine lover, this gave me several opportunities to try some really great Pinot Noir wines. On our next wine tasting tour we hope to visit some of the other 20 or so wineries within the Washington County area. I highly recommend that you visit any of the wineries mentioned and expect some great hospitality and some pretty good wine too. 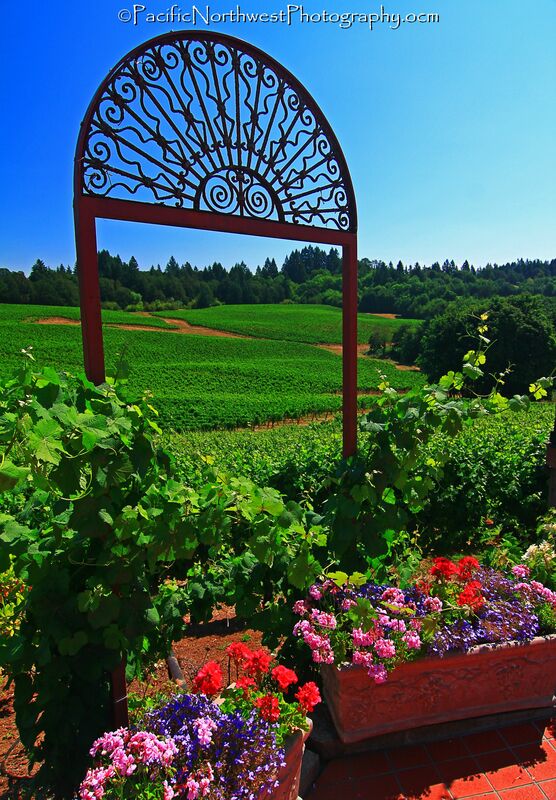 The photo shown on my blog was taken at Elk Cove Vineyards. It was about 10:30 in the morning so the sun wasn’t too bright. There were several shady areas around the trees and their grounds have several flowers that create an epic scene. I never used my tripod on this trip since there was no need. To get this shot I had the camera set at Auto Exposure and the ISO at 100. The white balance was set at -1 and the F stop at 7.1. Since the sun was so bright I also attached my CIR-PL and my Warming filter. I was using my 12-24mm wide angle lens and had the focal length at 14mm. The Exposure Time was at 1/100 second. Photographing wineries can be real challenging since you are always trying to get as much of the vineyard in the frame without having too many distractions in the photo. I tried to incorporate as many trees and flowers as possible without losing sight of the main subject.